In Western Christianity, readings (often chanted) and choral settings of extracts from the book are used in the Lenten religious service known as Tenebrae (Latin for darkness). In the Church of England, readings are used at Morning and Evening Prayer on the Monday and Tuesday of Holy Week, and at Evening Prayer on Good Friday. Clines, David J.A. (2003). "Lamentations". In Dunn, James D. G.; Rogerson, John William (eds.). Eerdmans Commentary on the Bible. Eerdmans. ISBN 9780802837110. Hillers, Delbert R. (1993). 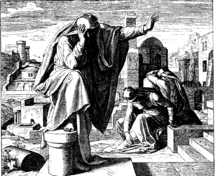 "Lamentations of Jeremiah". In Metzger, Bruce M.; Coogan, Michael D. (eds.). The Oxford Companion to the Bible. Oxford University Press. ISBN 9780199743919. Lee, Archie C.C. (2008). "Book of Lamentations". In Sakenfeld, Katherine Doob (ed.). The New Interpreter's Dictionary of the Bible, Volume 3. Abingdon Press. ISBN 978-0-687-33365-3.